It has finally begun one of the most anticipated and exciting events related to the mobile technology of the year: Google developer conference. The annual event, which takes place in Mountain View, is also the most anticipated by fans of Android. And Google has already shown a lot of news on the first day; in fact, it was the CEO Sundar Pichai, in person, from the main stage at Shoreline Amphitheatre, who announced the most attractives. These innovations range from a new personal assistant, a very advanced home automation device, until the new version of Android. Here they are in detail. Some rumors about this voice assistant for home had already appeared in the press. 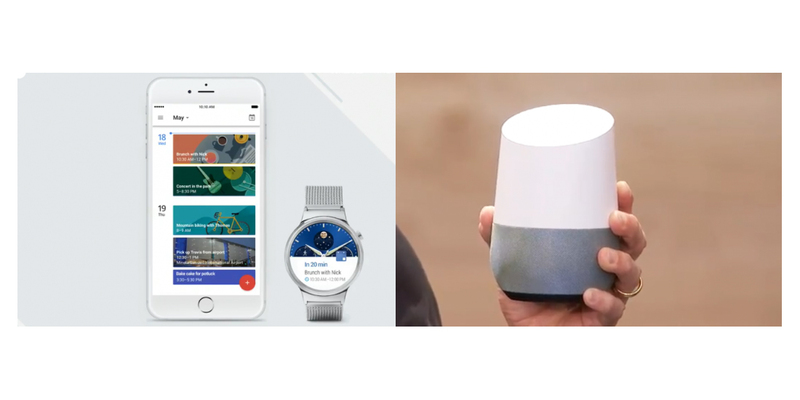 Google Home has been shown at the beginning of Google I/O 2016, and apparently it is a voice assistant that resembles the Amazon Echo. It is a cylindrical device, customizable color (so it can become a component of decoration), without key: only voice commands. With Google Home, that would come later in the year, you can ask to turn on the lights in the house, to launch the other home automation functions or play music. But above all, Google Home stands because you can ask questions as if you surf the internet using Google, such as: find me a flight, reserve a car, etc. Of course, Google Home interacts with users through Google Assistant, the other news of the day. In this case, Pichai left some interesting words: "It will be a personal assistant, and you can ask tough questions, because it will be able to understand and take into account the context of subsequent questions." Pure artificial intelligence, in short. The new Google Assistant compete in the world of voice assistants, where there are already Siri and Cortana and integrated into smartphones, the smartwatches, in cars and even in living rooms, thanks to Google Home. This is very interesting news, as established by the CEO on the research network. "One fifth of the US search -said Pichai- by users is made verbally while half search is made over the phone." We could not miss this novelty, given the current undisputed leadership of Facebook instant messaging (WhatsApp). Google announced Allo, a new application that, like WhatsApp, is connected to the user's phone number, but also to your Google account. It is a built-in voice assistant suggesting intelligent answers and is able to recognize images as would the search engine. It also enables high cryptography (said so during the presentation), and the opportunity to talk anonymously to remove the chat at the end of the conversation. Also in combination with the Duo application, you can make video calls. Both will be available this summer on Android and iOS. Of course, he also talked about the new version of Android N, although the full name will remain unknown for the moment. The new features announced include Vulkan, through which developers can harness the power of the device on gambling and then, increase security -according to Google- through each file based encryption. So, instead of encrypting the entire drive, you can protect individual files. New commands: with two taps on the bottom right of the screen you will open the last used application. It will also include optimized notifications: you can reply directly from the panel without having to access the app (already present in the future Apple iOS). new emoji are also provided. Android N will arrive during the next summer. During the Google I/O 2016 there has also been room for wearables, with Android Wear 2.0. A major upgrade for lovers of smartwatches. The update integrates more intelligent answers and some graphical improvements. Very interesting, in this sense, the new feature that automatically recognizes the type of activity being carried out. With Android Wear 2.0 the intention is to make the smartwatch independent of the smartphone, thanks to some native applications. Google also focuses heavily on virtual reality, and presented during the opening DayDream, virtual reality platform that will match perfectly with Android N. Obviously, not all phones are compatible. However, Google explained that most device manufacturers are already working on it. Attached to the platform, Google has also thought of the viewer and controller. With DayDream there will be a game store dedicated to virtual reality. Otherwise, DayDream will arrive in autumn and seems to have everything planned to revolutionize the mobile gaming market. Finally, news in Android Pay. For the first time the method of payment will cross the US border and arrive in England. Then, in one year, also to Australia.